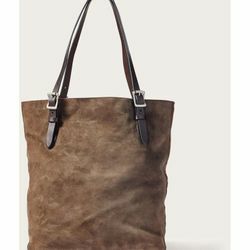 Filson Tall Rugged Suede Tote Bag. The Tall Rugged Suede Tote is crafted at Filson's Seattle factory using the finest American leathers. The body is made of boot-grade Rugged Suede leather from Chicago's Horween Tannery that's specially treated to provide lasting water protection. Adjustable handles are made from Filson's signature Bridle Leather that's vegetable-tanned in Pennsylvania by Wickett & Craig.